ABOVE: The marble staircase and entrance to the old Stasi headquarters are considerably more grandiose than the offices and prison cells inside the building. The Museum in der Runde Ecke (in English, "Museum in the Round Corner") occupies the former district headquarters of the East German State Security Service or "Stasi" in Leipzig, Germany. When I use the word "occupy," I'm not exaggerating: On December 4, 1980, peaceful demonstrators entered the Stasi's "Runde Ecke" building to stop destruction of files on citizens that GDR secret police had compiled over the previous four decades. 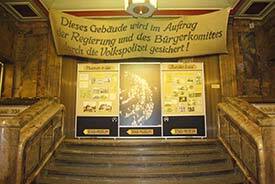 Soon afterwards, the nonprofit Citizens' Committee of Leipzig formally took control of the premises, and the building now houses a permanent exhibition titled "Stasi--Power and Banality." "Right in the former offices of the Stasi employees, visitors can now informally about themselves Stasi's function, methods and history. The Citizens Committee has tried to preserve the original environment to give visitors to authentic impression of the atmosphere in the 'round corner' up to 1989. Linoleum floors, brownish-yellow wallpaper, folding grills at the windows and doors, exposed cable ducts and old radiators are still found throughout the entire museum. Here history is visible and palpable." The museum's greatest challenge--a shoestring budget--has also proven to be its greatest strength. As you walk through the corridors and offices, you'll see and feel what the building was like in the days when Stasi officers recruited informers with incentives or blackmail, compiled reports on East German citizens, opened mail from abroad, planted cameras and other monitoring devices in buildings, and interrogated prisoners. The Museum in der Runde Ecke is open daily from 10 a.m. to 6 p.m. except for December 23-26, New Year's Eve, and New Year's Day. Admission is free. The Citizens' Committee of Leipzig also operates the Stasi Bunker Museum in Machern (about 30 km/20 miles from Leipzig) and offers tours several times a year to the former Stasi execution site at a prison in the Leipziger Südvorstadt. For more information, visit runde-ecke-leipzig.de and click "English" in the lefthand navigation menu. Be sure to view the captioned photos on page 2 of this article to get a hint of what you'll see at the Museum in der Runde Ecke. And don't miss our article on Leipzig's Forum of Contemporary History museum, where you can learn more about life in the former German Democratic Republic. Museum in der "Runde Ecke"